Nerf-tastic isn’t a word yet. This game won’t help. Video gaming is a sequel driven industry. Anything that does well you can expect to see again. 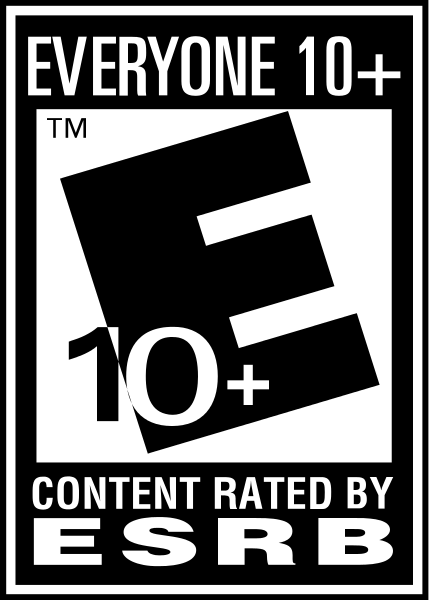 Such is the case with Nerf N-Strike Elite, whose predecessor was apparently EA’s second best-selling Wii title last year. In regards to gameplay, it fares better than the arena-based first game. Still, this package falls short in living up to the childhood fun of its source material and offers very little in the way of value. Nerf N-Strike is a family friendly on rails shooter, ingenious because it replaces real life guns and ammunition with harmless Nerf blasters and darts. The first game focused on basic shooting minigames and other challenges, but this time there is an actual scripted campaign adventure to play through. It is a light gun game like Time Crisis or House of the Dead, just with a completely different audience in mind. The game comes bundled with a multipurpose Nerf blaster, The Switch Shot Ex-3, that can be used to house the Wiimote while playing, or as a regular dart gun for your own entertainment. The set up for the game’s story is as follows: A group of tweens who specialize in wielding Nerf guns to combat dangerous robots must make their way through a multi-billion dollar robot compound to take down a rogue AI droid and save their friend. It is very Saturday morning cartoonish, so I can’t see youngsters finding any faults with the story, which is never the strong point of this light gun game anyway. Gameplay is simple - all you do is point and shoot at enemies. The trigger is pretty much the only button you will ever have to use, unless you pause the game or switch weapons by pressing right on the D-pad. The controls are spot on, with the only thing to really complain about being the lack of feedback from firing. Then again, these are projectile sponges, so the very fact that they can cause robots to explode should be impressive enough. Linearity is a strict tenant of on rail shooters, but the dull way this game goes about it really hampers the experience. When on foot the movement of your character feels forced and mechanical. The camerawork does very little to spice things up. Sometimes it’s not too bad, such as when it pans behind cover while you square off against some of the game’s bigger foes, but for the most part the uniformity of it all will take you out of the experience. Luckily, there are sections - even entire levels - when your character rides on a fast-moving or airborne vehicle while blasting bots to bits. These spice things up considerably and prove to be the most exciting parts of a very boring game. One new feature is the Red Reveal attachment for the Switch Shot Ex-3. It is a decoder lens, like the ones found as prizes in cereal boxes. Here it serves to highlight hidden messages to open locked doors or locate weak spots on enemy targets. Whilst it works, it will only be of real use to the youngest of gamers who are unable to discern noticeable color contrast on their own. Usually, whatever needs to be shot at will be bright yellow, red, or orange. The gimmick comes in handier for revealing secret messages hidden amongst scrambled letters and symbols. The enemies certainly don’t help to make this game any more exciting. The total number of different enemies clocks in at fewer than 10 types. You will face off against brightly colored bots that can morph into harmless vehicles, slightly larger bots that morph into harmless vehicles, pesky globs of goo that must be shaken off your weapon should they latch onto you, and various forms of mechanical flyers. The AI isn’t too bright, there are many instances where they just stood still as my teammates and I blasted them to pieces. You have very little control over preventing the loss of energy (life) other than shooting all your foes before they shoot you. One gameplay element I found myself enjoying somewhat is the way you have to shoot canisters (to use as currency) and markers (to regenerate energy or ammo). There are no ammo pickups throughout the levels, so you are stuck with whichever blasters you select before the start of each mission. Outside of the campaign, there is a challenge room where you try to accumulate the highest point total with many different weapons by shooting everything in sight. Honestly, the packaged Nerf gun was my favorite part of the experience. 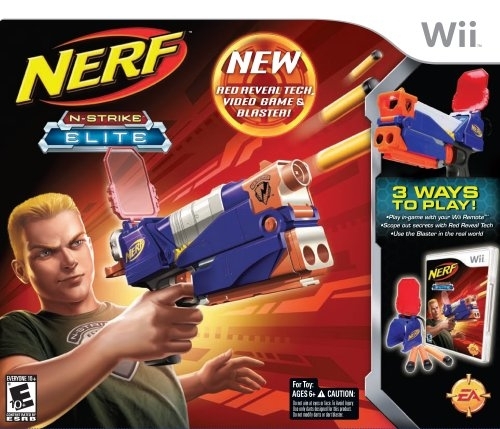 There are no real differences between this toy gun and the one that came packaged with the first Nerf game for the Wii, other than the aforementioned Red Reveal. Nevertheless, the peripheral is a quality accessory that works well with the Wiimote and other shooters on the system. I don’t know if this is good or bad, but I had a lot more fun playing with the dart gun on my own than in the game. It is pretty standard as far as Nerf products go these days but that doesn’t stop it from being a really cool toy to play with and keep around the house. From a presentation standpoint, there is not much to discuss here. The graphics and art direction are colorful but far from impressive. On the technical side of things, I experienced no real problems other than some enemies materializing or disappearing through walls. The guns make a lot of whooshing sounds as they fire and the explosions don’t pack much of a punch, but this was all done with the family friendly angle in mind. The young voice actors do a good job at injecting this teen cast of character with a dose of authenticity, but I feel the music direction was a misstep. The soundtrack takes itself too seriously and would feel more at home in a T or even M rated game instead of here, where the onscreen action fails to live up to the excitement and attention of the music. Nerf N-Strike Elite’s other flaws would have been more forgivable if it weren’t for its dire lack of value. My first solo playthrough of the campaign took me two hours flat to complete. I was absolutely stunned to see the credits roll so quickly after a disappointing conclusion that brings down an otherwise serviceable narrative (hint: expect a sequel). The game is equipped to play through with a co-op partner and doing so provides you with a longer campaign as you will now have access to many secret areas, but even then the playtime barely scratches four hours. There are, however, plenty of real and fictional Nerf weapons to unlock and even achievement-like challenges to pursue. To accomplish these tasks though, you will have to complete the brief campaign multiple times, and I cannot envision many gamers wanting to do this. One last thing to mention is that this game is currently only available in a $60 SKU that comes with the Switch Shot Ex-3, so if you want the game without an extra blaster you’re out of luck (although it's cool to have a peripheral for both players anyway). I can give kudos to the developers of Nerf N-Strike Elite for trying to make one of the most accessible genres even more accessible by opening it up to the family audience, but the brief, boring campaign and steep price makes this an extremely hard package to recommend. I hope that the inevitable sequel will improve on the series' formula, just as this does over its predecessor, but as it stands I recommend forgoing this experience and playing with actual Nerf toys in real life instead. Right, one million finally! 140th Wii million seller. Finally! Million seller! :D Took its time! 983k, it seems it still sells... Should hit the million somewhere in 2012. I wonder if this game is still selling a bit? Now at 976k. 961k in America only. Could definitely reach a million! it already ousold the original.